Do you remember those days in high school when Valentine’s rolled around and you waited to hear your name called over the intercom to come pick up flowers sent by an unknown admirer? Then you’d carry your vase from class to class so that the whole world (meaning the cool kids) would know someone loved you. Yeah. Didn’t happen to me, either. Well, there was that one year my mother sent me flowers. Sigh. How uncool is that? I knew it was sweet and thoughtful, but it wasn’t cool and that’s what I was after. Thank goodness I’m not a teenager anymore. And as an adult I know something I didn’t know then. Flowers from my mom are WAY cooler than flowers from some boy I’ve long forgotten. My mom loved me from the moment she knew I’d been conceived. And sending me a rose with baby’s breath in a bud vase on Valentine’s Day spoke of pure love. So did the bouquet of flowers Dad hid in the fridge (he took out the food and the shelves so it would fit) to give to me the day I graduated college. So did the florist-delivered flowers my husband sent pretending they were from Thistle to thank me for all the dog walks. Those flowers said LOVE more than any teenage, February 14, hothouse flower ever could. But the very best flowers I’ll ever receive come from my Father each Appalachian spring. 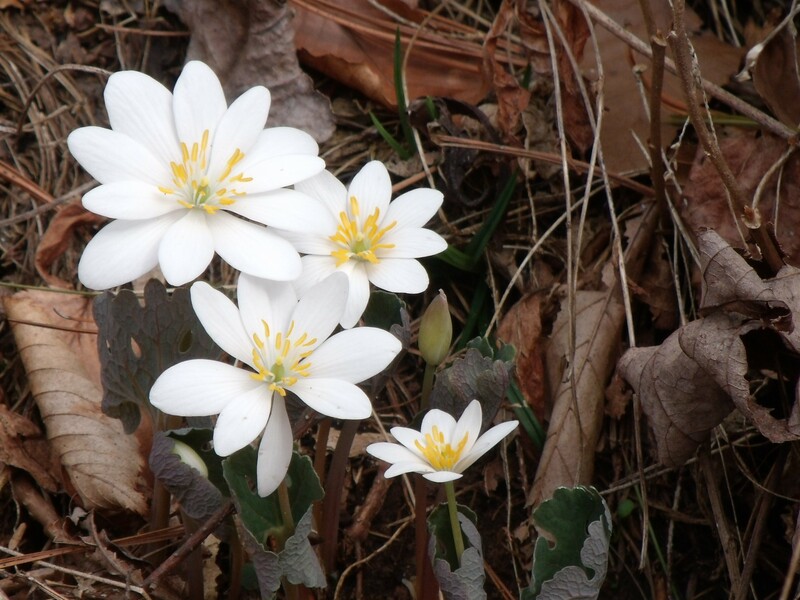 It won’t be long now until crisp, white bloodroot pops up along woodland trails. Next come the dwarf iris and showy orchis. The trillium and honeysuckle. Mountain laurel and rhododendron. They just keep coming from the first crocus pushing up through the snow to autumn’s Joe Pye weed. God is forever giving me flowers. More than I can count or hold or appreciate. He gives me flowers without my asking and whether I thank him or not. He gives me flowers because he loves me. Already I can see the tips of daffodil stems peeping through the snow and the Lenten roses are defying winter. Now that’s the best Valentine ever. Now that’s just what I needed to read this (once again) bitter cold snowy morning! Thank you Sarah Anne and thank YOU Father God. I talked to Him and He says we’re both welcome. Thank you for this piece! And weren’t you blessed to have such a sweet Mom?! You’re welcome and I still am!